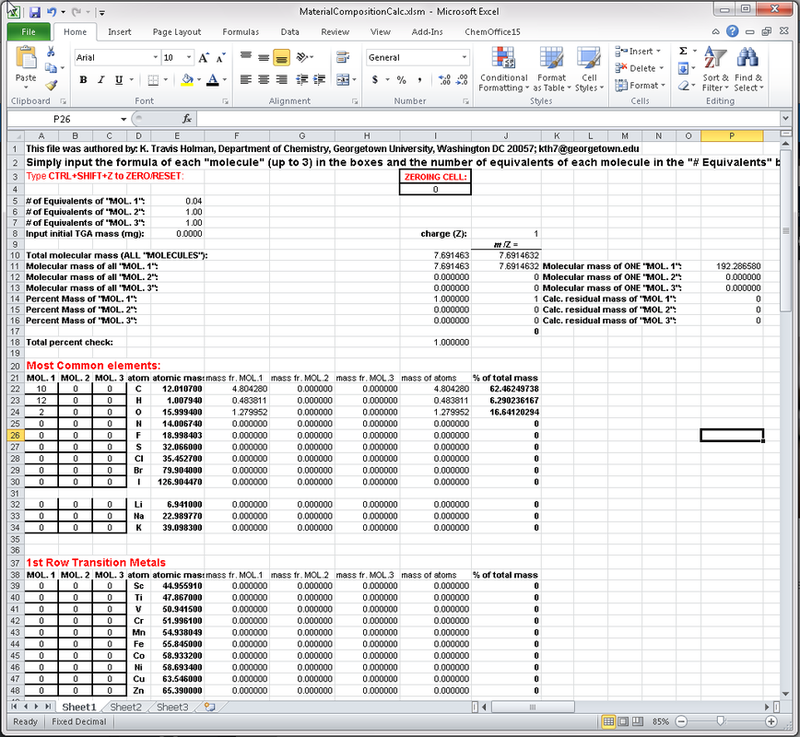 The Materials Composition Calculator is a free Microsoft Excel spread sheet application developed by Travis Holman to assist in quick calculation of average molecular weights, elemental percent compositions, theoretical crystal density, and percent mass composition of each component of an up to three-component solid. Conveniently, the material may be stoichiometric or non-stoichiometric, as per the User's need, and up to ternary composition. Simply input the formula of each component (MOL. 1-3), choose the stoichiometries of each component (# of Equivalents of MOL. 1-3), and the application will calculate the percent mass composition of each element in the material and each component. If the crystal unit cell and Z are known, the density can also be calculated. The application is particularly suited for rapidly determining, by trial and error, the relative stoichiometry of each component in comparison to thermal gravimetric analysis (TGA) data (% mass loss). It is also useful for calculation of expected combustion (elemental) analysis data for multicomponent, even non-stoichiometric materials. It's great for salts, solvates/hydrates, cocrystals, and other inclusion compounds, and doesn't require fixed stoichiometry. 2 equivalents of phenyl succinic acid (PSA, C10H10O4), 1.5 equivalents of pyridine (pyr, C5H5N), and 0.16 equivalents of ethanol (EtOH, C2H6O). Or, equivalently, TGA analysis of an ill-defined, partial ethanol solvate of a 4:3 PSA:pyr cocrystal shows a 1.4% mass loss just above room temperature, followed by a 23.1% mass loss above 100 degrees Celsius. The bulk material therefore contains ~0.16 equivalents of ethanol. Data entry for this calculation takes about 30 seconds, and the stoichiometries can be easily tweaked to match TGA or combustions/elemental analysis data. If you find yourself using it, please shoot us an e-mail and/or acknowledge it in any publications.